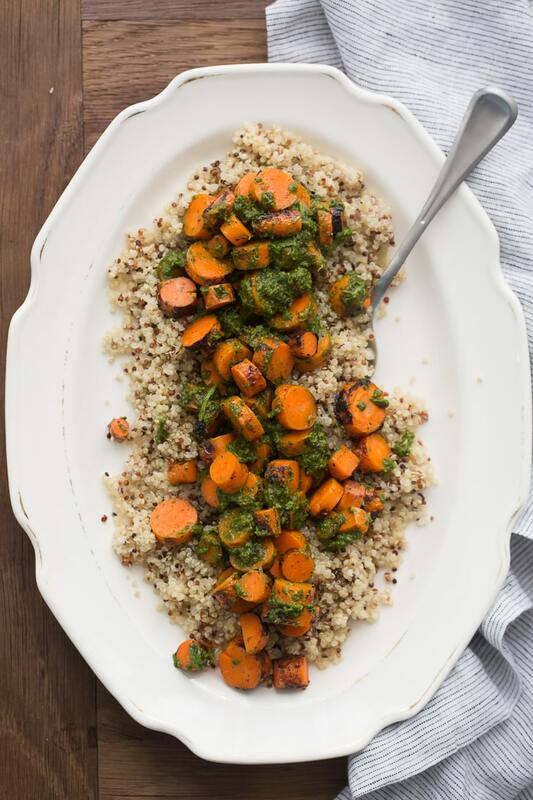 Grilled Carrots with Chermoula | Naturally. When I first moved my diet towards being whole foods/plant based, summer family get-togethers were tough. I’d go and attempt to pick at the food options which nearly always consisted of the traditional American cookout: burgers/hot dogs, chips, potato salad, and coleslaw. This usually meant I’d leave hungry and have to run home to eat before doing anything else. This morphed into me bringing a box of vegetable burgers (it was a start) to eventually preparing a couple sides to introduce everyone to something new. Sometimes people would eat it out of politeness while others actually enjoyed the change of pace. In terms of recipes, you can’t really get much easier than this. You can make the chermoula up ahead of time (there’s a note on the recipe about this) and then simply take your carrots ready to grill (and be prepared to convince people that you’re not pretending the grilled carrot is a hotdog- I’ve heard this one before and see it occasionally floating around the internet). 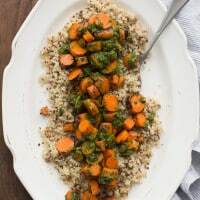 This recipe is great by itself, served over your favorite grain (I prefer quinoa or couscous), or even toss together with some greens for a salad. 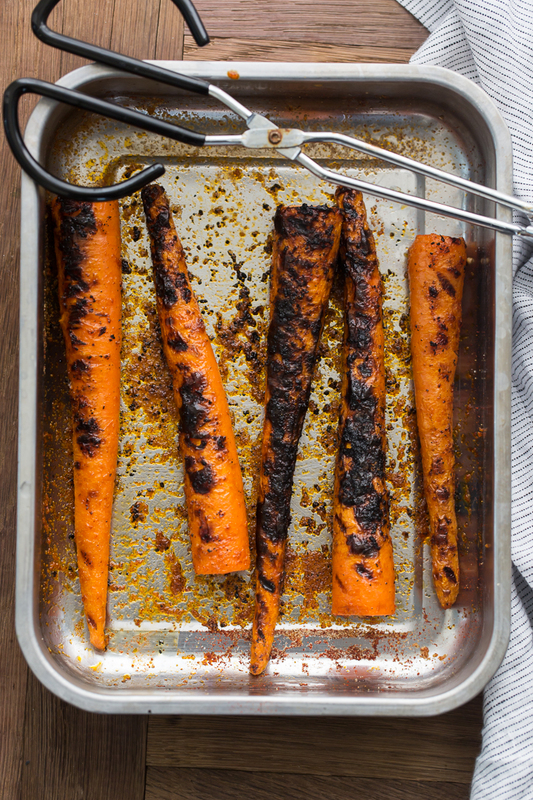 One great thing about grilled carrots? Not even a need to peel! Light grill to medium heat. In a large dish, combine carrots with olive oil, garlic powder, paprika, and salt. Toss carrots until well combined. Transfer the carrots to the grill and cook for 2 to 3 minutes on each side until carrots are charring and starting to cook through. Remove and let cool slightly. Follow the directions for making the chermoula. 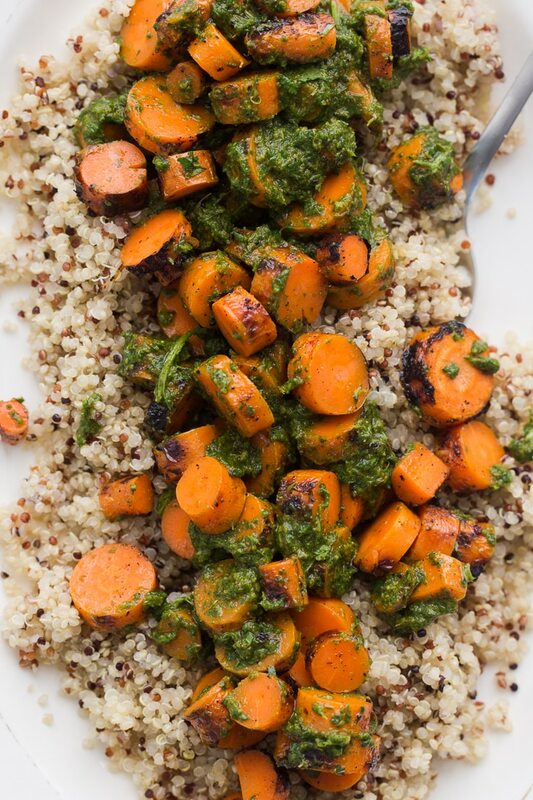 Slice the carrots into 1/4″ circles and toss with a few spoonfuls of the chermoula. Serve over your favorite grain or green (pictured above is serve over quinoa). This looks fabulous. I’m like you were – bringing veggie burgers to our family get-togethers. I am going to bring this along next time. Yum!! Ah, the never-ending struggle of attempting to maintain a whole/clean eating diet at family gatherings…. I know thee only too well! Also, I love the combination of carrots and strong, punchy herbs (I recently posted a salad quite like this myself). I adore your simple, yet innovative recipes, Erin!